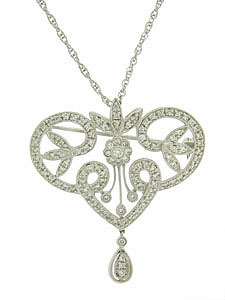 Diamond frosted organic cutwork curls and spins together to form this magnificent antique style necklace. A teardrop of additional diamonds dangles from the sparkling form. The pendant is set with approximately .85 carats of round cut diamonds and measures 1 3/4" long, 1 3/4" wide. Finished with a pin back, the necklace measures 17" in length.